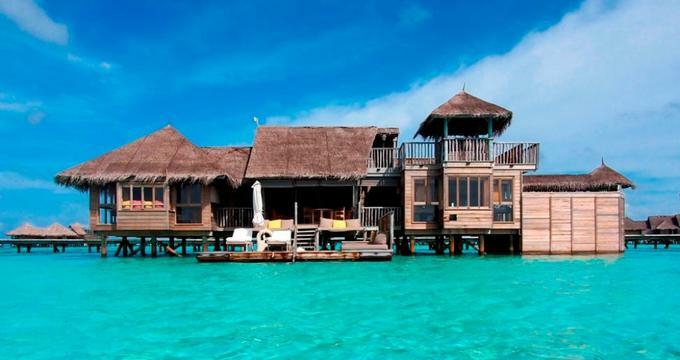 Located on the private island of Lankanfushi in Male Atoll and surrounded by lush tropical gardens, Gili Lankanfushi Maldives is a luxurious island retreat in the Laccadive Sea. The stunning seaside resort features elegant, overwater villas constructed from natural materials and accessed by boardwalks from the island. Exquisitely appointed villas have wooden floors, open-air living rooms, and stylish rooftop terraces, and upgraded villas offer sumptuous dining areas, mini wine cellars, and private motor boats. Some villas include personal butler services, state-of-the-art cinemas, and private spa areas. The resort features a variety of upscale, beachfront dining options including fresh seafood and handmade Japanese cuisine, an overwater bar and a chocolate and wine cellar. Upscale facilities range from a beautiful swimming pool with sun decks and loungers, a tranquil water garden, an exclusive spa and wellness center that offers traditional Ayurvedic treatments and yoga programs, and a modern cinema. Other recreational activities include snorkeling and scuba diving, island day trips and tours, and tennis. Villa Suites are 210 square meters in size and feature open-air living rooms with daybeds, elegant dining areas, beautiful rooftop terraces with daybeds and dining tables, bedrooms with king-size beds dressed in luxury linens, and semi-open en-suite bathrooms with walled glass showers, plush towels, bathrobes and slippers, and designer toiletries. Villa Suites have spectacular overwater sundecks with sun loungers and umbrellas. Lagoon Suites enjoy the same facilities as Villa Suites, along with private water hammocks. Six Luxury Residence Villas are 250 square meters in size and feature spacious air-conditioned living rooms with two large daybeds, dining tables, and mini wine cellars, bedrooms with king-size beds dressed in luxury linens, and semi-open en-suite bathrooms with walled glass showers, plush towels, bathrobes and slippers, and designer toiletries. Residence Villas have rooftop terraces with daybeds and dining tables and overwater sundecks with sun loungers. Located at the far end of a private jetty that extends out above the turquoise waters, the Gili Lagoon Residence boasts 250 square meters of space and features a spacious air-conditioned living room with two large daybeds, a dining table, and a private mini wine cellar. The master bedroom has a king-size bed dressed in luxury linens, and a semi-open en-suite bathroom with glass-walled shower, plush towels, bathrobes and slippers, and designer toiletries. The Gili Lagoon Residence has a glorious rooftop terrace with a daybed and dining table, and an overwater sundeck with sun loungers and private hammocks. The magnificent Crusoe Residence stands alone in the Indian Ocean and is accessed by a private motorized boat or the resort pontoon. The 250-square-meter villa of features a spacious air-conditioned living room with two large daybeds, a dining table, and a private mini wine cellar. The master bedroom has a king-size bed dressed in luxury linens, and a semi-open en-suite bathroom with glass-walled shower, plush towels, bathrobes and slippers, and designer toiletries. The Crusoe Residence has an incredible rooftop terrace with a daybed and dining table, and an overwater sundeck with sun loungers and private hammocks. The Family Villa is a private island cabana with 350 square meters of space and is ideal for families or groups of friends. The Villa features a master bedroom with a king-size bed dressed in luxury linens, and a semi-open en-suite bathroom with glass-walled shower and an outdoor shower, plush towels, bathrobes and slippers, and designer toiletries. Two spacious air-conditioned living rooms have comfortable sofa beds, one of which can be converted into a second bedroom with two single beds, and a fully equipped kitchenette is perfect for self-catering. The Villa also features a rooftop terrace with a daybed, outdoor dining facilities, a Jacuzzi tub, and spa beds for massages, an in-villa steam room, a private mini wine cellar, and an overwater sundeck with sun loungers. The Private Reserve offers unrivaled rustic über luxury in the form of a decadent private palace surrounded by a sapphire lagoon. The opulent Reserve is 1,700 square meters in size and boasts uninterrupted views of the Indian Ocean with two master en-suite bedrooms, a third guest rooms with en-suite bathroom, private indoor and outdoor relaxation areas and sun decks, and a large central open plan living area with a sea garden and a natural coral pool, an outdoor dining area, writing desks and chairs, and elegant daybeds. The villa features an infinity swimming pool on the upper sun deck with a water slide leading into a private lagoon swimming area, an air-conditioned gym on the second floor, a private cinema, and a private couple’s spa with a sauna, steam room, and indoor and outdoor treatment pavilions. A private wine cellar houses over 400 reserve labels, two rooftop terraces have two open-air dining pavilions, a fully equipped gourmet kitchen is perfect for entertaining, and personal butlers, chefs, and housekeeping staff are available. There are easy-to-use motorized transfer boats for exclusive guest use, along with a luxury yacht for arrivals and departures. Luxurious amenities and facilities at the Gili Lankanfushi include an exclusive award-winning spa that offers traditional Ayurvedic treatments and yoga programs, a beautiful swimming pool with sun decks and loungers, and a tranquil water garden. There is also a modern cinema, a variety of upscale, beachfront dining options including fresh seafood and handmade Japanese cuisine, an overwater bar and a chocolate and wine cellar. Recreational activities include snorkeling and scuba diving, island day trips and tours, and tennis. Gili Lankanfushi is a magnificent venue for romantic over-water weddings, ranging from intimate ceremonies at the stunning over-water chapel to a champagne sunset dhoni cruises and star-lit private dinners on One Palm Island. This timeless haven offers a one-of-a-kind sanctuary for a celebration of a lifetime with a variety of exquisite venues, including the Lagoon Champa, One Palm Island, Over Water Bar, the Private Reserve, and Palm Beach.